Be the first to share your favorite memory, photo or story of Ramona . This memorial page is dedicated for family, friends and future generations to celebrate the life of their loved one. 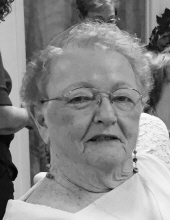 Ramona Lee Hicks Downs, 77, of Dixie, passed away Thursday, February 7, 2019 at Forrest General Hospital. Visitation will be Monday, February 11, 2019 from 1 – 3 p.m. at Moore Funeral Home in Hattiesburg with services immediately following at 3 p.m. Burial will be in Dixie Baptist Church Cemetery. Mrs. Downs was a member of Dixie Baptist Church. She also drove Forrest County school buses for several years. She is survived by her husband of 59 years, Ray Downs of Dixie; one daughter, Stephanie (Mike) Beasley of Dixie; one son, Toxie (Belinda) Downs of Dixie; six grandchildren, Robbie, Zachary, Amber, Raquel (Jeff), Allison (Erik), and Tommy (Madison); three great grandchildren, Steele, Olivia, and Presley; numerous nieces and nephews; and many others that called her “Nanny”. To send flowers or a remembrance gift to the family of Ramona Lee Hicks Downs, please visit our Tribute Store. "Email Address" would like to share the life celebration of Ramona Lee Hicks Downs. Click on the "link" to go to share a favorite memory or leave a condolence message for the family.